The contents of the following was sent to a Dell representative after being told to “Call tech support” with zero assistance otherwise. I had been in need of some real help while being under some intense pressure from multiple sources, and Dell dropped the ball. This is the email I sent to my Customer Support Representative Ian – who was actually on leave from work at the time. He had been great at handling requests, but his replacement was much, much less than helpful to my cause. I know you aren’t working.. and hate to send you this message. Perhaps when you return, we can discuss things further. Just a bit of a background into this issue. The customer I sold this computer to is in Hunstville, ON and they were borderline about buying the PC, but I promised I would do everything to work with them to get this new computer working. This would have been a win-win (and certainly another computer sale wouldn’t hurt). While working with them, it became clear that their logistics program had a weird way of working with the system that Windows 7 64bit wasn’t going to work (not to mention printing was just not working). Since I was committed to getting this working, I decided to come back to you to try and find a way to get the customer back on Windows XP. 2. Knowing that there were no drivers on the website (the person I spoke to directed me there without even looking himself) – generally Dell has, in the past not supported Windows XP on the support website (and I had confirmed that). What I received was, to me, was the runaround. Your backup person Drew failed to assist me on every level and I’m quite disappointed (and actually angry). You may not know this – and I understand it – but I spend quite a bit of time pushing many customers. 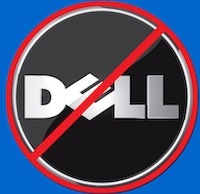 to standardize on Dell and in turn purchase thousands of dollars of Dell product. I think I’m an important enough customer NOT to say “Call tech support” and be thrown in the queue. Sorry again for interrupting your time off. I’m going to now consider other options without Dell right now to try and get this problem resolved.